Through the years, Shimano has produced some of the very best big game reels, and you can add the Tyrnos 2-Speed Reel to the list of reels that won’t fail you. These big game trolling reels are built with a die-cast aluminum frame for enhanced strength and durability. While the graphite side plates reduce the Tyrnos Reel's overall weight, the combination of metals keeps moving parts aligned for increased efficiency and longevity. "I bought the 12 two speed. Its very good for trolling and yo-yo or jigging. 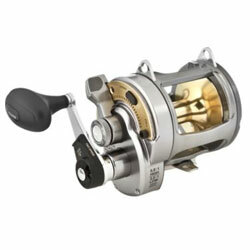 But too heavy even with model 12; very heavy to cast; free spool not the best; You can't fish whole day with this reel. Weight alone will make you tired; Probably need some muscle for me; try casting with this before you buy; if its right for you excellent; Has a very good drag ( I accidentally hit a rock while yo-yo end up using the reel as an anchor for a 28ft panga in San Quintin, Baja California) and gear ratio is good for wahoooo; This reel is durable but not an all around reel."